Welcome to 5H Custom Meats! 5H Custom Meats is excited to announce the opening of their brand new facility in Hermann, Missouri! 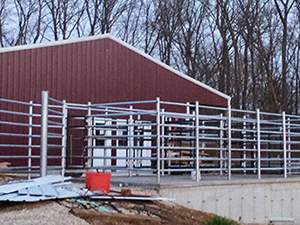 5H broke ground in November, 2014, designing a home base meat processing facility with the customer as the focus. With ease of access as a priority, new unloading chutes and holding pens are strategically located to allow the highest degree of safety and convenience. 5H Custom Meats is serving all of Gasconade, Warren, Montgomery and Franklin counties, providing quality service at an affordable price. 5H offers beef, hog and deer meat processing in whatever cut desired. Snack sticks, deer sausage, pork sausage, roasts and loins are just a few meat products and cuts produced at 5H. Arlin and Anita Hoener are just two of the five Hoeners in 5H Custom Meats. They are proud to say that their business is family owned and family operated. Each of their three children is an important part in 5H Custom Meats. Arlin has over twenty years of experience processing meat and making sausage. Over the years, he has developed his own special blend of seasoning for sausage making. Samples are available upon request! The motto at 5H is "Your meat, Your way". It doesn't matter if the customer brings in beef, pork or deer to be processed, 5H handles the meat with care and precision. Any meat brought in is carefully marked to guarantee that the meat brought in will be the meat taken home. There is absolutely no substitution of meats. If you specify that you would like all of your beef processed into ground beef, then every cut of your meat will be processed as you have requested. For beef or hog processing, 5H also offers a farm kill or home kill option, coming to your farm or home for animal pick up. This service is offered as a convenience to the customer. Please inquire about this service for rates. Come visit 5H Custom Meats today for a look at their new facility in Hermann. 5H looks forward to working with you! © Copyright 2018. 5H Custom Meats, LLC. All Rights Reserved.